A Better Homes & Gardens Top 10 Quilt Shop! The Hickory Stick Quilt & Gift Shop in Historic Downtown Hannibal offers quilting fabrics, hand-dyed woolens, flannels, and batiks to delight quilting enthusiasts. Our large display of quilts, vintage Redwork and stitchery will be sure to impress! 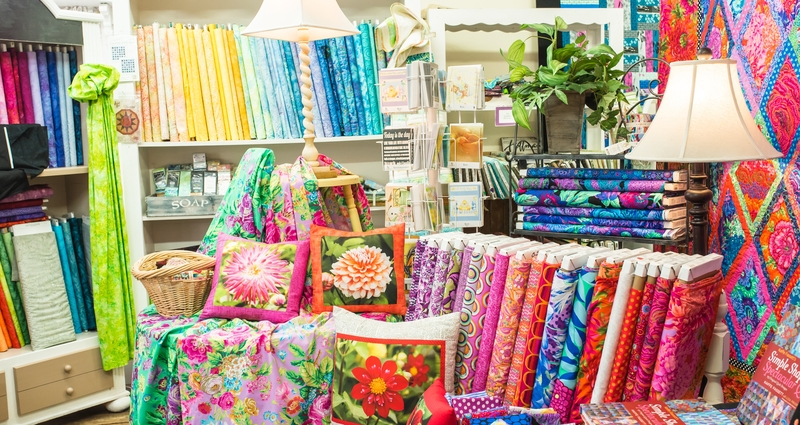 With over 2,000 bolts of fabric, you are certain to find all of your quilting needs in this delightful quilt shop. The look of the store changes continually in order to keep up with styles and to provide an ongoing source of inspiration. Thanks to the shop’s location, tourists from all over the world join area quilters as frequent shoppers in the store. The Hickory Stick has numerous classes and workshops. Shoppers are drawn into the Hickory Stick by the stunning window displays which feature quilts, fabrics, and gifts. However, it is what is inside the store that keeps them coming back. Few shops offer our variety of fabrics and outstanding displays which catch the eye and inspire the imagination. We offer so much help and caring that the shop starts to feel like home. We strive to be among the best, and we are hoping that you will plan a trip to the Hickory Stick.It will be a trip of a lifetime, and our quilting supplies and expertise will bring you back to Hannibal again and again! Make the Hickory Stick Quilt Shop in Hannibal your must-see store! Grab a passport for the Missouri Highway 36 Quilt Trail and enjoy 17 different shops!